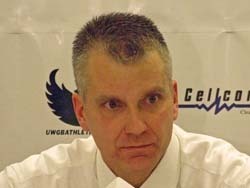 Just two-days after a rare road win at UW-Milwaukee , the UW-Green Bay Phoenix stumbled at home in men&apos;s college basketball last night, losing 65-54 to Wright State at the Resch Center in Green Bay. The Phoenix moved from 3rd place to fifth place in the Horizon League with one loss in one night. Green Bay shot just 27% from the field in the first half and dropped to 4-5 in Horizon League play. DeShaun Wood scored 23 to lead the Raiders in the win. Mike Schachtner scored 14 to lead the Phoenix. The win for Wright State is their 6th in the last 7 games as they sweep the season series against the Phoenix.